Reshaping of the nose with rhinoplasty surgery offers a lot of change possibilities to the osteocartilaginous support framework. 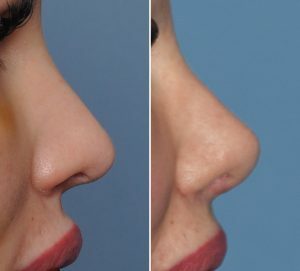 Rhinoplasty surgery can not, however, just make any change that a patient wants. Thus it is important before surgery to educate the patient as to what realistically can and can not be done. One type of nose shape look that some female patients request today is known as the ‘Barbie Nose’. In looking at the actual doll from which this nose shape name derives, it is seen that it is a small and petite nose that has a low bridge and a bit of an upturned nasal tip. Certainly a doll-shaped nose that one might say is disproportionately smaller for the face onto which it sits. For a patient to achieve such a look they would have to not have a reasonably large nose initially that has thick nasal skin. Medium sized ones with thinner skin are always the best candidates. Surgically in the properly selected patient, the combination of changing the profile of the dorsal line and tip changes can be achieved. 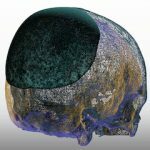 Lowering the middle vault septal height and the upper nasal bones through osteotomies and cartilage resection achieves half of the goal. Nasal tip shortening and upward rotation through resection of the some of the caudal septum and tip suturing to the septum changes the lower third of the nose shape. By contemporary rhinoplasty standards, the ‘Barbie Nose’ result does potentially create certain structural concerns. 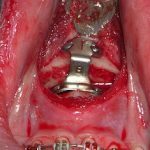 Lowering the bridge and middle vault does create the risk of nasal airway obstruction. Rotating up the nasal tip will rest in greater nostril show. This may or may nor counteract the potentially negative effects of internal nasal valve narrowing that can result from lowering the middle vault. Technically the Barbie nose rhinoplasty violates some of the contemporary concepts of nasal airflow and how to avoid it in rhinoplasty surgery. Patients considering the procedure should be so advised.